Here is Everything You Need to Know About Friday's Vernal Equinox Supermoon Solar Eclipse, from an Astronomical, Cultural and Energetic Perspective! It’s a big week, folks, as we are moving towards one of the most powerful days of the year: Friday, March 20th, which sees a new moon ‘supermoon’ total solar eclipse and the spring equinox falling on the same day. On this day, we will witness a rare astronomical event which has the potential to stir up some very powerful energetic shifts for our personal and collective transformations. This moon is called a ‘supermoon’ because it is at the closet point to the earth in its orbit (known as perigee), only about 222,192 miles away (357,584 kilometers). But, the moon will not be visible to Earth because it is a new moon. There will be a total six supermoons in 2015: Two have already happened, Friday marks number three, and the remaining three will occur in August, September, and October. September 28th’s supermoon will actually be the closest of the year, and will coincide with a lunar eclipse. Eclipses can only happen at the new moon, when the moon passes in between the sun and the earth, blocking out the sun’s light. On Friday, the moon will completely block out all of the sun’s light in a few select places in the Northern Hemisphere, leading to a near ‘totality’ (or complete darkness) close to two minutes over Greenland, the Faroe Islands (UK) and a small group northern Norwegian Islands called Svalbard. In these areas, the shadow of the eclipse will measure as large as 90 miles! 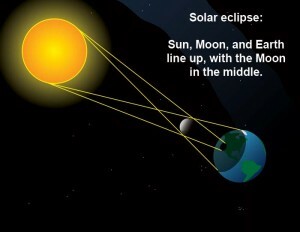 The most incredible part of the eclipse, when the moon is directly in front of the sun, will take place at approximately 9:46 am UT (5:46 am ET). Some Northern European countries including Ireland, Scotland, Norway, Finland and Sweden will see at least 90 percent of the eclipse (weather permitting), whereas 50 to 80 percent of the eclipse will be visible on the mid-European continent. For the exact path of the eclipse, check out the NASA .gif below. If you don’t live in Europe, you can still watch the eclipse live online thanks to the Slooh Community Observatory. Also please remember that you should never look directly at a solar eclipse because it can damage your eyes! This solar eclipse falls on the vernal equinox in the Northern Hemisphere (an on the autumnal equinox in the Southern Hemisphere), marking a transition in the Earth’s journey around the sun. 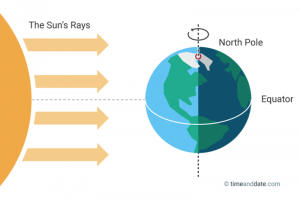 At each equinox, the sun passes the Earth’s equator, making it directly overhead at noon. Vernal is Latin for “spring” and equinox is Latin for “equal night,” meaning that on the vernal equinox, we get about the name number of hours of daylight as we do darkness (although this can vary a little bit depending upon where in the Northern Hemisphere you are located). Essentially after the vernal equinox in the Northern Hemisphere, the number of hours of daylight increases, whereas the opposite is true in the Southern Hemisphere where Friday marks the autumnal equinox. See this image from date&time below. 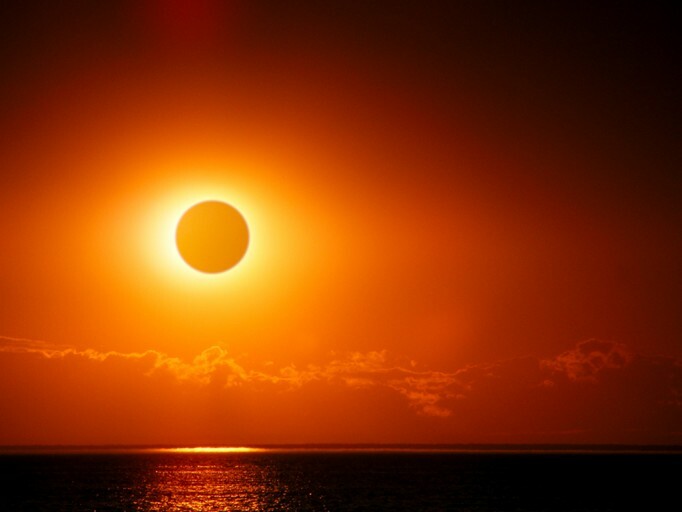 A solar eclipse on the vernal equinox is a rare celestial event indeed, with the next one happening in 2034, and then it will not happen again until 2053 and 2072! For more about how this cycle works, read this article from EarthSky.org. The vernal equinox has long been celebrated by nearly all world cultures as a time of rebirth, fertility and new opportunities. There is a symbolic meaning here, shared by our histories and collective consciousness reflecting renewal and hope. The spring equinox celebrated by the Pagan traditions was known as “Ostara” in early Pagan Germanic countries, usually a celebration of planting the new spring crop. It was also celebrated by the Mayans, ancient Romans, and by the ancient Egyptians as the festival of Isis. It is believed that this Pagan fertility holiday eventually transitioned to become the Passover ceremony in Judaism and the Easter ceremony in Christianity Modern Pagans and peoples of many different faiths and denominations still celebrate the spring equinox as a time of fertility, growth, and the returning of the creative energies of the divine feminine. I chose to separate energetic factors from astronomical factors in this write-up because while the astronomical details of these celestial events are generally accepted as proven, scientific fact, it is much more challenging to empirically prove the astrological energetic shifts that occur during these events (for example, there is evidence both supporting and denying a correlation between lunar cycles and human/animal behavior ). However, as we find with many ‘metaphysical’ or more abstract phenomena (such as the existence of consciousness, where exactly IS it? ), just because science cannot yet empirically measure, operationalize and prove its existence… does not mean that it does not exist! Many people report feeling energetic shifts and changes during celestial events, some quite profoundly, which is perhaps why these phenomena have been celebrated with rituals and ceremonies since the dawn of time. I reconcile it like this. As a psychologist writing about the experience of astrological events, what matters most to me is that fact that people perceive themselves to be experiencing energetic changes and shifts during celestial events like eclipses and equinoxes, and these perceived shifts can affect their thoughts and behaviors. Whether they are actually literally experiencing the pull of the planets, or this is something that is happening in the individual mind, or this is just a feeling that is being intuited from our collective consciousness, it still remains a valid experience if people believe they are feeling these energies and seeking to work with them. If thousands or maybe millions of people on Earth simultaneously believe that the spring equinox offers them an opportunity for rebirth and growth, does this not make it somehow real to our collective? This solar eclipse marks a time for breakthrough, coming in the last degree of Pisces, which is also the last degree of the Zodiac. The energies shifting from Pisces (a water sign) to Aries (a fire sign) can leave us with a feeling of urgency of rushing to make decisions and wrap things up, and combined with the Equinox occurring 13 hours after the eclipse, we can feel really pushed to grow, change and innovate. This can be great, if we are acting from a present and grounded place, but it can also be problematic if we are trying to rush into things without planning and preparation. Ultimately, this is a profound time for new beginnings, for letting go of what no longer serves us, and for embarking on new and exciting journeys in uncharted territory. This may be exactly the moment you have been looking for in your life! Still, it is natural to feel some fear or trepidation as you release the past and expand into the unknown. Just remember to keep an open heart and an open mind, and welcome in whatever arrives, especially if it is unexpected. This could be an auspicious time for relocating or moving, a new job, pursuing a new hobby or forming new relationships. When we look at these shifts on a global scale, they also are incredibly powerful and give us a lot of potential to make big waves with our collective intentions for the planet. So many of us are working and devoting ourselves to making the world a better place, either by lending efforts to sustainability or Earth-friendly initiatives, by working in the healing field, or as teachers, mentors and counselors, even by just doing the little things like paying it forward, or spreading love and positivity in our lives to the people we meet. Every single little bit counts! We are waking up and beginning to see the effects of this global shifting mass consciousness. This eclipse and equinox provides us with an opportunity to step together into a new paradigm that we can create, as we work together help usher the planet into an era of kindness, unconditional love and equality. Consider the growth and change of our collective as you set your intentions this Friday. Listen deeply and tune in your emotions…. The solar eclipse happening in Pisces means that we have potential to develop new insights and intuitions on people and situations. Quiet your mind, and listen closely. You might uncover important information about a person or situation that has been confusing or eluding you. Set intentions for new beginnings…Find it in yourself to forgive the past and clear the space for whatever new and amazing possibilities you are seeking. I like to write down what I hope to achieve and let into my life in the next couple of months, and speak then speak it out-loud as intentions to the universe. Let go with grace… Be prepared to say goodbye, and to release the people/beliefs/situations in your life that no longer serve you. It might be painful, it might be scary, or it might be liberating depending on your attitude and circumstances. You might have had a really tough week as you shift and release, please trust that things will get better next week! I also like to write down what I am releasing from my life and then burn the piece of paper. Be sure to stay grounded… As you embrace these new possibilities, do not force or rush into making decisions. If you are making a life changing decision, really ask yourself, “Is this in line with my highest self?” and take a moment to reflect. Think and feel deeply about the choices you make, because they will echo through the next few months. When in doubt, take a deep breath and slow down. Keep an Open Heart & Open Mind… We can never predict what the future holds, or where our decisions will lead us. If you are pursuing life changes, a new job, moving, new relationships or new creative pursuits, recognize that the outcome might be different from how you anticipated, and this is OK. What the universe has in store for you might be so far beyond what you can even imagine. Try to embrace the unknown and go with the flow. Consider the Shift Happening For the Collective…Our world is reaching a precipice where big changes are happening, and need to continue to happen, in order for life to survive and thrive. Every little thing you do to be part of the solution, from spread loving kindness and compassion, to making people smile, to paying it forward, to recognizing that we are all brothers and sisters of humanity, can make a huge difference. If we can collectively set our intentions for goodness for the human race and for all life, it is possible that we can use Friday’s energies to have an lasting impact on the flow of life over the next several months. Wishing you profound blessings and love as we work together through our personal and collective transitions!